How to find Strathnaver Guest House Oban. 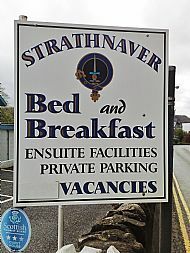 Strathnaver Guest House is very easy to find and is one of the first properties you come to as you drive into Oban. As you come down the hill and see your first glimpse of Oban Bay you will know that Strathnaver is not far away - we are on the left hand side just after The Kings Knoll Hotel. The guest house is well signposted and we have private off road parking for all our guests vehicles. If you are coming by car from further afield a route planner can be found using the following link to AA route planner. There is a frequent bus service to Oban from various locations in Scotland. Click the following links for bus timetables from West Coast Motors or Citylink. Regular trains run from Glasgow Queen Street To Oban station. It is a scenic 3 hour journey along the West Highland line and is one of the most beautiful rail routes in the country. Train timetables can be found by using the following link to Scotrail. 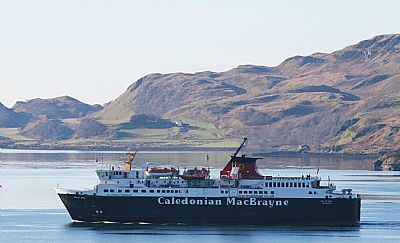 Caledonian MacBrayne operate regular car and passenger services from Oban to Mull, Barra, Coll, Tiree, Colonsay, Islay and Lismore in the Western Isles. It is advisable to book in advance is you are planning to take your car. Timetables and Online booking for Oban ferries can be found at the following link for the Calmac. The guest house is a 10 minute walk from Oban train and bus stations or a very short taxi ride - the taxis wait just outside the station. Nearest airports are to Oban, Glasgow, Prestwick and Edinburgh. The journey to Oban will be a memorable part of your visit to Scotland as we have some of the best scenery in Scotland.